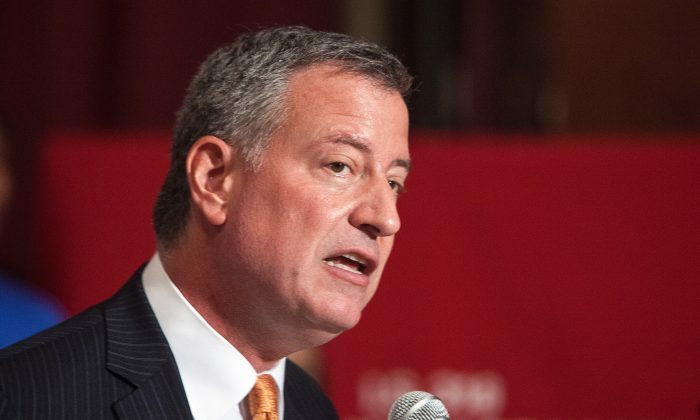 NEW YORK—Mayor Bill De Blasio dodged responsibility and promised change responding to an extensive report on violence against Riker’s Island prison inmates published Monday by The New York Times. The report focused on 129 cases of inmates seriously injured by correction officers last year, pointing out instances where excessive force may have been used. De Blasio recognized “the current state of affairs is unacceptable,” but said “a lot of steps are happening” to improve the situation. New Correction Department Commissioner Joseph Ponte is known for cutting back on the use of solitary confinement, a sprawling practice under his predecessor Dora Schriro. Critics say the practice of keeping a prisoner isolated for 20 to 23 hours a day prevents violence momentarily, but can lead to an increase in violence in the long term. Grassian noted that it’s especially so for those diagnosed with a mental disorder. About a third of the 11,000 Riker’s Island inmate population and majority of those seriously injured by the prison guards have mental disorders. The city’s budget addresses the mental health of prisoners with $32 million for treatment programs and more correction officers.